Several MR imaging criteria for ECE have been used. Table 1 presents commonly used criteria for ECE with its specificity and sensitivity. Most frequent used criteria are asymmetry of the neurovascular bundle, obliteration of the rectoprostatic angle, and bulging of the prostate capsule (Fig. 3). SVI is detected by an abnormal, asymmetric, low signal intensity within the lumen on T2-weighted images (Fig. 4) . It should be noted that amyloid deposits, stones or blood could also cause low signal intensity of the seminal vesicles on T2-weighted images [14-17]. 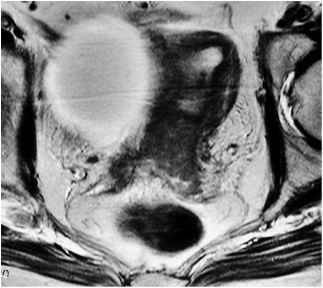 In staging, MR imaging should have a high specificity for periprostatic extension, to ensure that only few patients will be deprived of a potentially curative therapy . Sensitivity for periprostatic extension is of minor importance, because even a low sensitivity is an improvement on clinical staging . MR imaging is considered cost-effective if performed in a subgroup of patients with a prior-probability of ECE of at least 30%; that is, a PSA greater than 10 or a Gleason grade greater than 7 .